About Knockout Challenge: company history, games, safety, green policy etc. Knockout Challenge has been trading for over 25 years and each year we grow from from strength to strength. 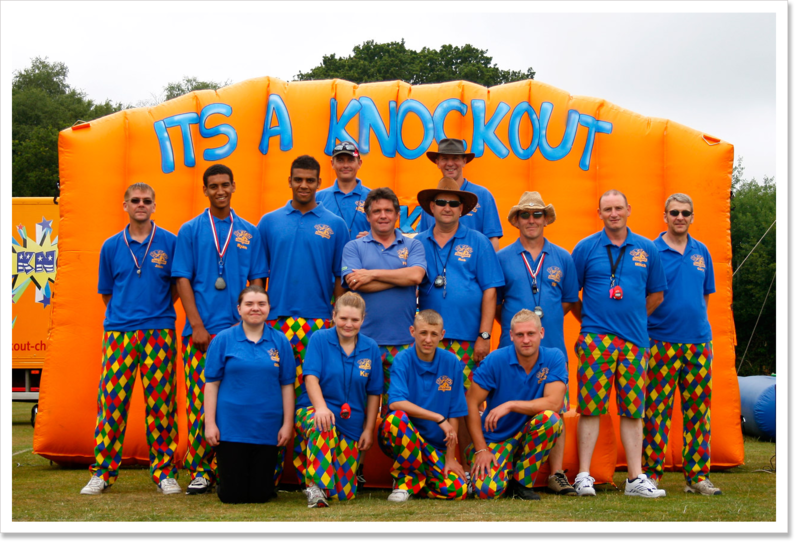 We have a number of independent games shows that travel the UK (and abroad) offering fun and exciting “It’s A Knockout” games shows run in a light-hearted atmosphere. 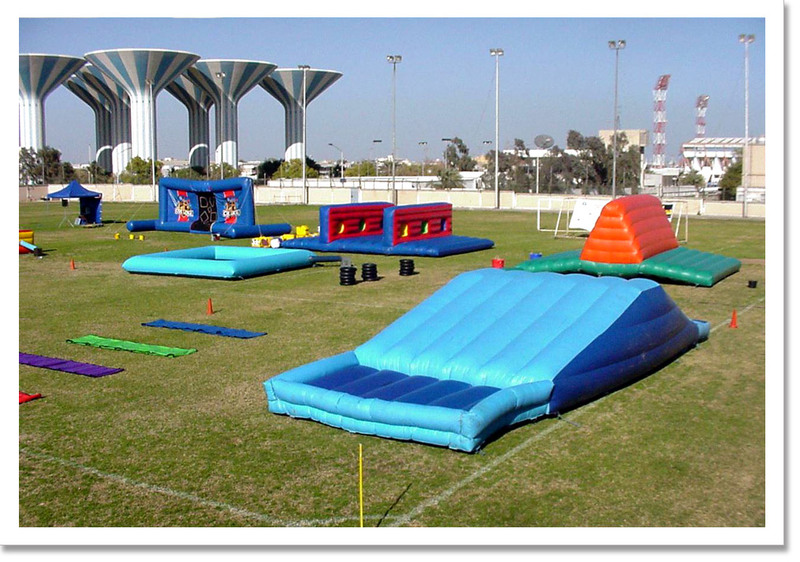 We use many colourful inflatable obstacles and our specially designed games are played so that everyone in every team is given the chance to take part in every game (if they wish to). 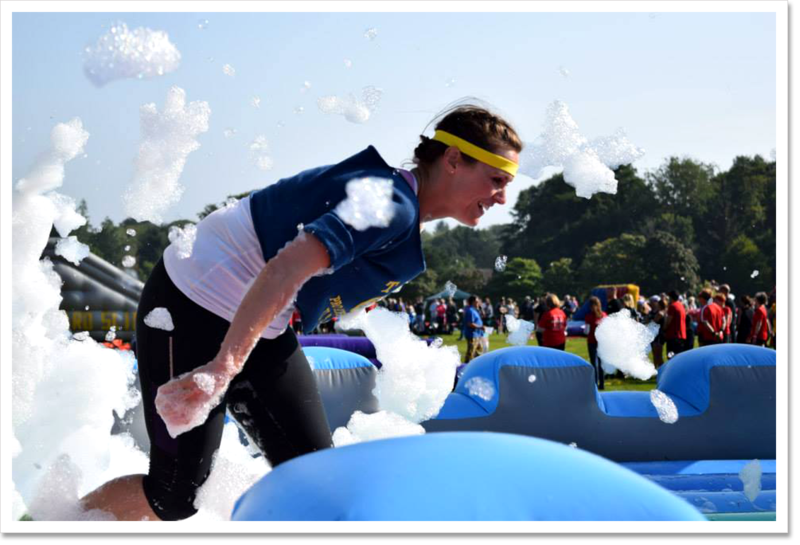 We are one of the (very) few FULL-TIME It’s A Knockout companies in the UK operating at over a hundred events each year. We have travelled as far away as Kuwait, Portugal, Ireland and Europe and have worked with Keith “Cheggers” Chegwin and many other celebrities. Our games have also appeared on TV a few times as well. We pride ourselves on the content of our games and the way they are run. We offer a games format show with lots of showmanship and not just running around on the grass type activities picking up balls. KNOCKOUT CHALLENGE is a registered UK company. 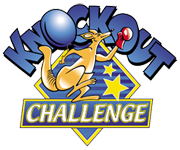 It is illegal for other companies or organisations to use the name “Knockout Challenge” or offer “Knockout Challenges” (called “passing-off”) this includes the use our kangaroo logo. We would appreciate the notification of any lawbreaking in this respect. 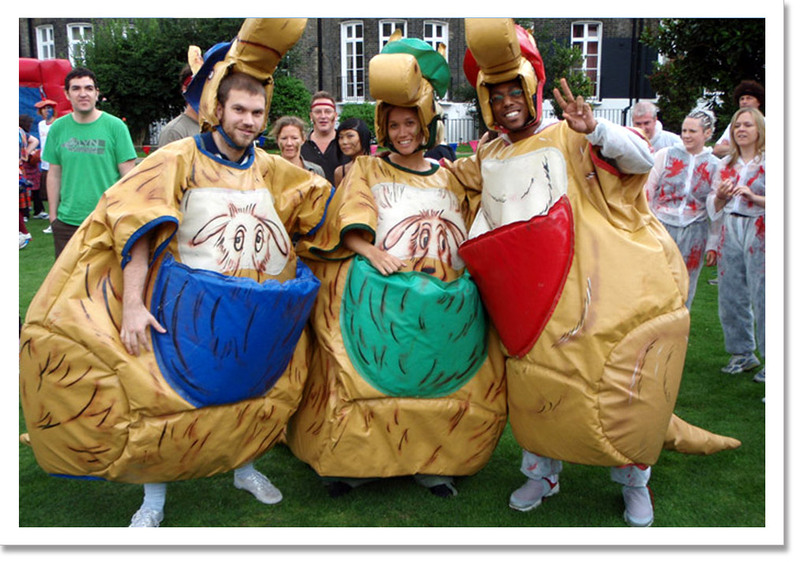 Click here to view a Barristers decision on the use of Knockout Challenge when used in connection with It’s A Knockout. Distance is not a problem as the image above shows. This was taken when we were in Kuwait for the Hala February Festival. We spent over three weeks in the country providing Tele Match (their name for It’s A Knockout) for the festival. We greatly treasure the memories of this visit and enjoyed providing the games and visiting this amazing country. Many of the shows featured on their Kuwaiti television any via the Hotbird satellite system. All our inflatable equipment carries a current ADIPS Safety Certificate. ADIPS is one of the two H.S.E. recognised safety schemes for inflatables. Our electrical equipment is PAT tested regularly. Our documentation meets with all council and local authority requirements. We adhere to the recently updated guidance from H.S.E. for inflatables and HSG195. 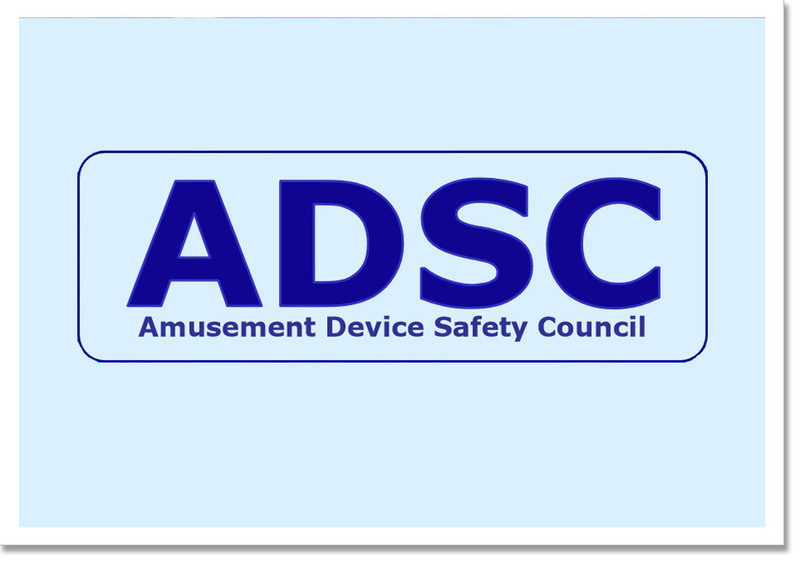 Knockout Challenge director Phil Pike also sits on the Amusement Devices Safety Council (A.D.S.C.) which deals with safety within the industry and is a board member of the ADIPS inspection scheme. We are active members of the Amusement Catering Equipment Society. A trade organisation for Showmen, Acts, Event services, Inflatable operators, Caterers etc. Please click on the Society’s logo below to go to their website. Green Footprints are now considered important by many companies and organisations. Since the introduction of BS8901:2007 it is even more important to consider an environmentally aware events company. We treat this subject seriously and are the only “It’s A Knockout” company to have a Green Policy. Electric devices are switched off (not standby) whenever possible. Printed paperwork is kept to a minimum. We fill our fuel tanks with high grade bio-diesel whenever possible. Our vehicle fleet is regularly maintained meaning maximum efficiency is achieved. Generators are turned off whenever possible. We don’t use “pools” which require 1,000’s gallons of water that will be thrown away at the end of the games. Water will be used to keep wastage to a minimum.